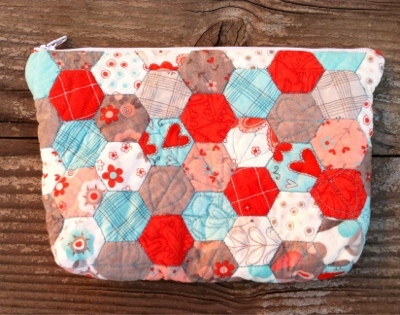 Yeah it's all done, my hand pieced Hexie bag made with a Flirt charm pack. This is my first of many hexagon projects done with EPP. I say many because I love this process and I joined a Flickr Sewing Bee group, Get Your Hex On. I am really looking forward to seeing what each month brings from around the world! There is a third group starting so if your interested go here. Your bag is very very pretty!!! Great work! I'm excited to try EPP. I love hand stitching and it looks so fun. Your little bag is too sweet! Beautiful bag! I love EPP too it is so much fun. Hiya! I'm in Hive #2 of the Get Your Hex On too and I'm looking forward to working on your block in April! Very cute bag. On my list of things to try. I'm loving the EPP!